It was a beautiful day today and I needed to get outside and get smokey. I decided to try some small scale baking. 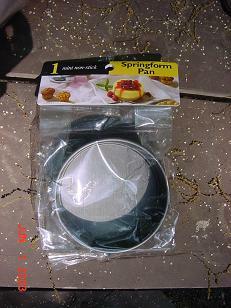 While strolling through Wal-Mart I found this small springform pan which I figured would fit inside my mess kit pot. I had intended to buy some paper muffin cups but since the pan was only $2.86 I thought I'd give it a try. I bought some blueberry muffin mix. Problem is the mix required milk. I couldn't find any powdered milk. It probably would have worked with water, but I decided to try it with vanilla pudding. 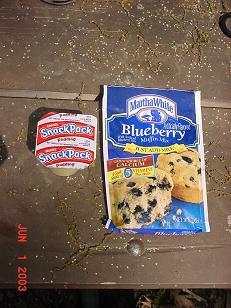 The mix requires 4 ounces of milk; one Snack Pack pudding is 3 ounces and the main ingredient is milk. I ended up adding a little water. Here's the muffin mix in the springform pan. I put some small rocks in the bottom of my pot before placing the pan inside so the hot air could circulate freely and evenly. 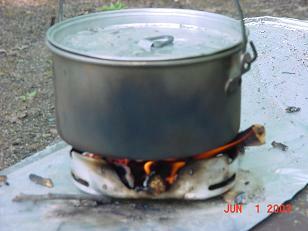 When doing primitive baking, one usually cooks with coals and puts those coals on the top and bottom of the pot. 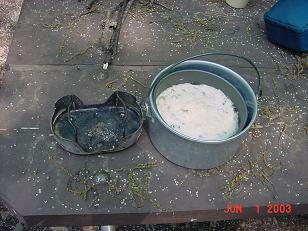 I deliberately cooked with flame and did not put anything on top as part of my experiment. Trying to keep it easy... My pan has a tight fitting lid: I think that's important. Here's the finished result. I can't say how long I cooked it as I had some trouble with my fire: it can be difficult to keep a fire going in very small, contained space. Nevertheless, I think it turned out pretty good! No part of the muffin was burned/scorched. © 2003 by Bill Qualls. 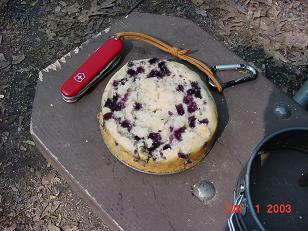 Back to my wilderness survival page.